Dietmar Kraemer, a practicing naturopath, has discovered a new approach to diagnosis and treatment with Bach Flower Remedies. New Bach Flower Therapies traces the relationships between the thirty-eight flowers in an unprecedented way. "Outer" flowers treat acute, more superficial problems, while "inner" flowers address the deep-rooted conflicts that are the source of surface symptoms. Kraemer arranges the inner and outer flowers into twelve "tracks," which can be used as models for therapeutic sequences. By illustrating each track with characteristic case studies, the author shows how varying motives and causes can lead to the same symptom, yet require individualized treatment. Kraemer's work is among the few new therapeutic applications to build upon Edward Bach's work of sixty years ago and remain in tune with his wish for simplicity and ease of use. Dietmar Kraemer, one of Germany's most innovative practitioners of Bach Flower Therapy, has developed powerful new therapeutic applications that remain true to Edward Bach's wish for simplicity and ease of use. 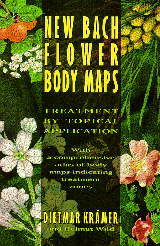 New Bach Flower Body Maps details Kraemer's unique system of diagnosis, in which 243 areas of the body are correlated with each Bach Flower Remedy, and are mapped out in diagrams indicating the relationship between remedy and body zone. By reading the body maps, one can treat both physical symptoms and their emotional causes more directly. Physical ailments are relieved when the flower essences are applied to the skin, and underlying emotional problems improve more rapidly after topical treatment than after taking the drops orally. Preventive treatments are also possible using the body maps. Kraemer's procedures are illustrated by many case studies which confirm the effectiveness of this significant new extension of Bach Flower Therapy. 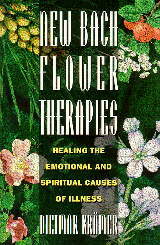 Bach Flower Remedies are also used in beauty therapy. Many practical examples illustrate the use of Bach Flowers in skin care.